Semi permanent home ramps are an easy and safe solution that provide inclusive access to a home, designed specifically to provide access over multiple steps in places where a portable or permanent wheelchair ramp would be impractical. Orthopedic Service Company provides semi permanent home ramps to customers in Durham, NC that can easily be installed at home. These products come in a wide variety of shapes and sizes suited to fit any individual requirements and handle any type of wheelchair access necessary. Semi permanent home ramps are meant to be used temporarily. Their modular construction allows for easily adjustable length and handrails are included when required. At Orthopedic Service Company, we pride ourselves in working with the best brands in the market and ensure we’re offering our customers the best semi permanent home ramps that Durham, NC has to offer. In order to assure the highest of quality standards, we only work with ADA compliant semi permanent home ramps, guaranteeing that they all meet OSHA and IBC2006 guidelines, so that everyone gets the best in terms of safety and quality. Semi permanent home ramps are a great access solution and a convenient alternative to concrete ramps, given that they can be easily modified, adapted and reused, provide a durable construction and finish that is made to resist years of outdoor use. 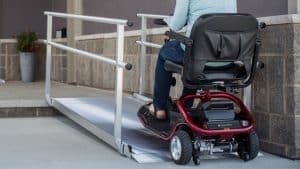 When looking to acquire a semi permanent home ramp, customers in Durham, NC will be happy to know Orthopedic Service Company provides a complete service that includes an assessment of their mobility and access situation in order to guide them during the process of selecting the ramp to fit their needs. Contact us today and let us help you find the perfect semi permanent home ramp.